If you wish, you can also skip ahead and download the finished code. Create a folder for our new project. Then, download tracking.js and uncompress the zip package. Grab tracking-min.js from the build subfolder and put it inside your new project folder. Next in our HTML file, we have a video and a canvas tag. The canvas tag is layered on top of the video tag using the above CSS. We will be using the canvas to draw the detected zones color so we can actually see what’s happening. Obviously, we set both to be the same size. Also notice that the video tag has the autoplay property set so the webcam feed actually plays (even if it’s live…). Then, we have a range input slider which will control the color tolerance and a div to display the currently selected color. Pretty standard stuff. Let’s look at the code. To be extra methodical, open the index.html page in a browser, open the development tools and check if “Page loaded!” is being output to the console. If it is, you are good to go. If it’s not, double-check that your files are properly linked. This code defines a function that will be called for each pixels of each frame of our webcam feed. This function receives the red, green and blue values of said pixel and should return true if we consider the pixel’s color to be matching the target color or false otherwise. The word 'dynamic' that is passed as the first parameter is simply an identifier for that color tracking function. We could define multiple color tracking function each with a different name. The way we will be using that is by calculating the Euclidian distance between the pixel’s color and our target color. If that distance is within the tolerance, we will consider it a match. The getColorDistance() function returns the actual distance. Then, we check if that distance is smaller than the value in our GUI slider ( slider.value). The colors are expressed as objects with r, g and b properties (integers between 0-255) which is what we used for our target color property. As a parameter, we pass in the name we used to identify our color tracking function from earlier. In this case, we will simply log the position of the tracked color if found. The reason there is a foreach() block is because the function may have tracked more than one isolated color blobs. As you can see data contains a rect object with x, y, width and height properties. There will be one rect for each detected color blob. Some options. In this case, it’s not just a regular video tag, it’s the feed from a webcam. 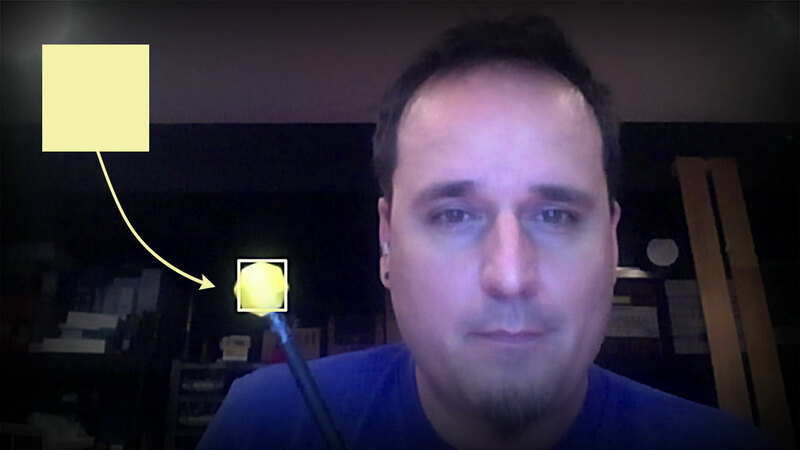 Knowing this, tracking.js will attach the first webcam it finds to the video tag for us. At this stage, if you open the index.html page in the browser, you should see the feed from your webcam. If you put a bright red object within camera view and increase the tolerance, you should also see some output in the console. It is hard to guess the color to track. The ambient lighting affects color rendition, a lot. Our hardcoded bright red (255, 0, 0) probably does not exist in your current environment. It is also hard to know if the tracking is working properly by simply looking at the console output. Let’s fix those two things. First, instead of manually entering a color to track, we will pick a color by clicking on it in the video feed. This way, we will know the color actually exists under the current lighting conditions. To get access to pixel color values, we actually need to create a temporary canvas and draw the current video frame onto it. Then, we are able to use getImageData() to fetch the color. This simply calls the getColorAt() function, assigns the returned RGB values to our color object and display the selected color as the background of our color swatch div. Click on the video. The color swatch should reflect the color you picked. This way, it’s going to be much easier to pick the right color to track. This simply draws a rectangle matching the zone that was detected. We are using the same color to draw the rectangle’s outline. Go ahead and try it! You should be able to pick a color from the video feed and see rectangles showing zones of that color in the feed. You can also use the tolerance slider to increase or decrease the precision of the detected area. By now you might be wondering about the performance of this library. I have not done any benchmarking but I can offer a way simplify the heavy calculations if performance is an issue for you. What you can do is use a lower resolution version of the webcam feed. Color tracking often works very well with a video as small as 160×120 for objects that are not too small. However, tracking.js (as far as I can tell) does not offer a way to control the size or frame rate of the video that is retrieved from the webcam. That’s why I submitted a pull request on GitHub that allows you to do that. If you want the following code to work, you will have to grab the modified version of tracking.js from my own GitHub (that is until the PR is merged in the main repo). As a sidenote, I noticed tracking.js’ GitHub repo seems to have been somewhat abandoned. Some pull requests and issues are 3-4 years old, which is never a good sign. This will allow you to retrieve a lower resolution version of the video feed. If you do that, you should also modify the video and canvas tags to use the same dimensions. You could also use the media constraint object to do things such as pick a specific camera (if you had more than one connected) or use a lower frame rate. You can learn more about media constraints by checking out the relevant MDN article. I guess that’s it. If you have not done so already, you can download the full code to help you get started. As I stated earlier, I do have some reservations with regards to the way tracking.js’ API was built. I’m also a bit concerned by the current state of the repo on GitHub. But, having said that, the code does work and you are free to contribute to make it better. I hope this tutorial was useful and, as usual, do not hesitate to leave comments below. Mad props. Thanks so much for posting this!